Mountain Mills Milk Substitute is a whey based beverage formulated to provide all the nutritional qualities of milk with added calcium and vitamins. Mountain Mills Milk Substitute tastes just like milk. Kids love the natural milk flavor of this delicious drink, which has been custom formulated and blended with vitamins A and D and real dry milk solids. One 8 oz. glass of Mountain Mills Milk Substitute contains 30 percent of the recommended daily allowance for vitamins A and D, and 45 percent of the recommended daily allowance for calcium. Now there is an inexpensive alternative that your whole family can enjoy. Just blend, chill, and enjoy. A taste you can feel good about. Storage: Dry pack Mountain Mills Milk Substitute may be stored in original sealed, oxygen-free cans for up to 5 years. All Honeyville family preparedness products are dry packed using oxygen absorbing packets which have been found safe and effective in eliminating oxygen in a sealed #10 can, providing ideal conditions for long term storage. 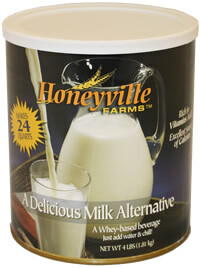 Ingredients: Sweet dairy whey, non-fat dry milk solids, partially hydrogenated vegetable oil (contains one or more of the following: coconut oil and /or soya oil), corn syrup solids, sodium caseinate, dipotassium phosphate, mono and diglycerides, lecithin, carrageenan, vitamin A, vitamin D3.